Then Garfield and Friends is for you as the world of Jim Davis’s Garfield is brought to animated life. Long suffering John, the perennially picked on Odie and of course Garfield, get themselves into all manner of predicaments, many of them lame, few amusing. Lorenzo Music as the voice of Garfield embodies the sarcasm and dry wit of the famous cat – as good, if not better than Bill Murray in the hideous big screen Garfield movie. 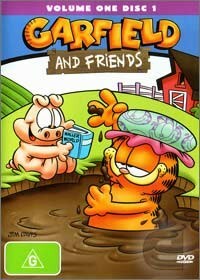 Also along for the ride, occupying the “and Friends” portion of the title are the characters from Jim Davis’s other comic creation, Orson’s Farm. Orson’s Farm follows the adventures of a group of farm animals including Orson the pig, a pair of sheep twins, a lazy rooster, a paranoid duck and a chick and unhatched egg. I found the Orson’s farm segments much more enjoyable, the ensemble lending itself to a wider array of stories – that and I’m not the world’s biggest Garfield fan. Despite the 1988 vintage many kids will no doubt get a kick out of the collection of cartoons presented – and I dare say many old school Garfield fans will relish the chance to enjoy the world of Garfield all over again.